In among the Excitebikes, Super Mario Bros., and Ice Climbers of the NES’s North American launch sat Donkey Kong Jr. Math, an edutainment title seemingly designed so that hopeful tots could point to it on the shelf and Trojan-horse Nintendo’s new Duck Hunt-playing powerhouse into the family home, parents unsuspecting, under the guise of a ‘learning machine’. Now making its return on the Wii U Virtual Console just in time for back-to-school, this NES oddity is an interesting mix that won’t satisfy a single player, but can be good fun with a friend. Perhaps predictably, Donkey Kong Jr. 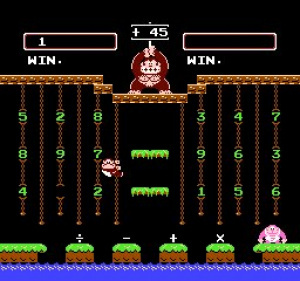 Math plays similarly to Donkey Kong Jr., with its vine-swinging and simple platforming, but adds in maths problems as part of the gameplay conceit. Single-digit integers line the vines, and mathematical symbols representing addition (+), subtraction (-), multiplication (x), and division (÷) sit on the platforms below. 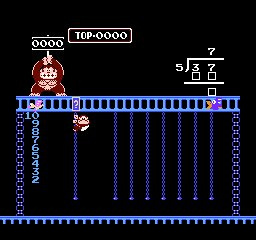 At the beginning of each round, Donkey Kong Senior holds up a sign with a certain number and it’s up to you, playing as DK the Younger, to pick up a sequence of numbers and operators that leads to the same result. There’s no limit on how many symbols you can use, or any bonuses for using fewer moves; if given ’49’, for instance, you could climb up to a ‘7’, drop down for an ‘x’, and then finish with another ‘7’, but you could also string together ‘4 x 9 + 6 + 7’ for the same effect. As is typical with most early NES games, there’s both an ‘A’ mode and a ‘B’ mode to the main game. ‘A’ confines your calculations to double-digit goals, while ‘B’ ups the stakes to include triple-digits and negative numbers — it also gives you a pre-set number to start each equation with, which makes reaching goals like ‘452’ with your one-through-nine vines much less daunting. It might not sound too thrilling, but swinging around the single-screen jungle searching for the right numbers can actually be quite fun in the right circumstances. The main problem is that those particular circumstances demand another person to play with, and playing by your lonesome gets old almost immediately. Even with only a single controller (virtually) plugged in, there’s still a palette-swapped pink ape in the bottom right of the screen — though instead of acting as an AI adversary, she simply stands there inert as you shimmy around the stage. Racking up five successful equations will “beat” your “opponent”, but victory feels pretty hollow when earned with an infinite head-start. Computer competition, time limits, a scoring system, or any other form of challenge or record-keeping would have added considerably to the appeal; as it stands, doing your sums solo simply isn’t that engaging. 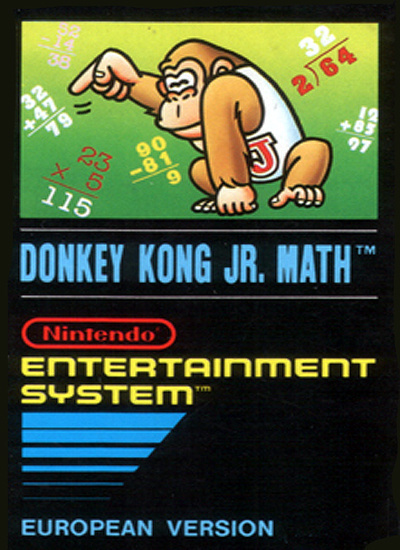 If you do manage to wrangle a Player Two into some competitive equation-solving, however, you’re in luck: Donkey Kong Jr. Math can be a bit of a riot. The simple controls and gameplay are easy to pick up, and tearing around the screen searching for numbers makes for classic, good-natured competitive fun. It’s part race and part quiz, and though the math is fairly simple, the limited pool of numerals means it’s not just about figuring out the answer first, but about figuring out how to get there fastest on a given board. ‘6 x 6’ might be the first path that comes to mind for making ’36’, but depending on the layout of the level, ‘4 x 9’ or even ‘3 + 3 x 6’ could both be quicker solutions. Time and economy (and a lack of parenthetical operations) also often reward overshooting and subtracting rather than slowly inching up towards the goal, which leads to a different way of thinking about the problems, and winning with a novel or roundabout equation is always satisfying. In addition to the main Calculate mode, there’s also a single-player-only Exercise option, though this feels less like a game and more like ‘maths with odd controls’. After selecting one of nine prototype problems, you’ll need to climb vines to varying heights in order to adjust number boxes and solve ten equations of the same type. The maths are much trickier here than in the main game, and it’s challenging in a Brain Age sort of way, but while the input method is fun for the first few rounds the novelty wears off very quickly. 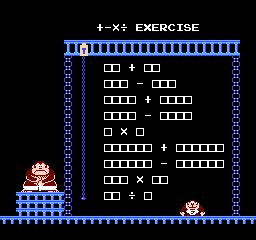 Ape aside, you could get the exact same experience from simply solving problems on paper, and apart from bragging rights and a high-score there’s really nothing to recommend the NES method over the analogue alternative. In terms of presentation, Donkey Kong Jr. 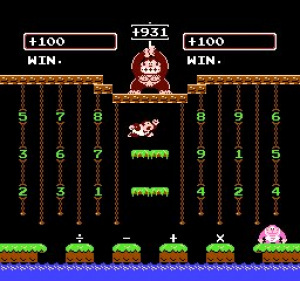 Math is nothing special; it features the classic sprite style and black backgrounds typical of early NES titles, and lifts its sound effects and music directly from Donkey Kong Jr. It has the retro charm you’d expect, but a lack of variety unfortunately puts this entry at the bottom of the 8-bit DK barrel — there’s only a single stage to monkey around in in each mode, and just two tunes to back up the action. Donkey Kong Jr. Math isn’t remembered very fondly, but don’t count it out entirely - while it’s certainly not for everyone, and you’ll absolutely need a second player to enjoy the experience, there’s still some fun to find among the figures. If you’re looking for an awesome maths-based platformer, we recommend Ace Mathician instead, but as a retro curio and a unique, surprisingly fun two-player experience, DK Jr.’s after-school special still adds up. I'd download this if it was on sale. I downloaded worse games on sale. Better than those bible games. Or better yet better than Dr. Jekyll and Mr. Hyde for the NES. I'll get this when it's 50% off. I've never played it before and it needs to be there with the other 3 NES DKs. @Imagamerboi Even though the two-player mode can be great with the right friends, as a package, I think it hits below par. The single-player mode just feels like a two-player game with no one else playing, and that's really disappointing - imagine if the computer opponents in the 'Arcade' mode of a Street Fighter game sat there and did nothing! This about sums it up for me. Thanks for the review! Forgive me for drifting off topic a little, but... Ace Mathician was a bit rubbish if you ask me. I 100% finished it in less than an hour and didn't have all that much fun doing so. 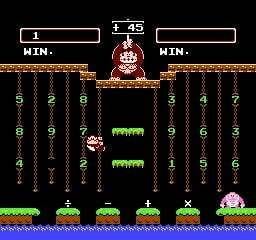 Some of the levels can be trivialised by doing stuff like jumping over the top of the screen, as if the developers somehow didn't think of that, and the math aspect just totally falls flat for me. All you're really doing is moving platforms back and forth, which doesn't require a whole lot of thinking, especially since you can just trial-and-error it. This game sounds like more fun, albeit perhaps only with two players. At the very least, it requires you to actually do math. why would they pay people to port this to Wii U. There are worse games already on the VC service. What a pile of Dog poop!! Thousands of classics out there and we get this? Good thing they paired it off with X3. Will be interesting to see what Nintendo does when the Nes/snes well runs dry! Well written review. Despite the game isn't good, I'm glad you didn't go full tilt sarcasm like many of the 1-stars. Glad you dug deeper to show the game does have some redeeming qualities. I own the original for NES but I won't be getting this for Wii-U. @joey302: Say what, Japan has turbo games? I thought they only got the PC Engine! Where's all our Turbo, Sega, N64 VC games that are only accessible in Wii-mode? @StarDust4Ever the turbographx is known as the PC engine in japan and yes they have 16 titles out now for wii u vc. All published by Konami!! We have zero!! @joey302 I am well aware that the PC Engine = TurboGrafx, just like Megadrive = Genesis and Super Famicom = SNES. I was alluding to the fact that you mentioned Japan was getting "Turbo" games. Oh, the irony! @StarDust4Ever it's ridiculous that they have them and we don't and while I have no problem whatsoever going into wii mode, there's no reason why those turbo games shouldn't be available here and now! !